It’s been a while since this album was released, so I’ve been lucky to have quite a few listens under my belt. Other than giving my humble opinion on the second album from SLC’s heavy metal crew Visigoth, I do want to address a couple things. One of them is what I came across browsing the web for reviews. The other the massive importance lyrics play—not just in metal, but in all music. 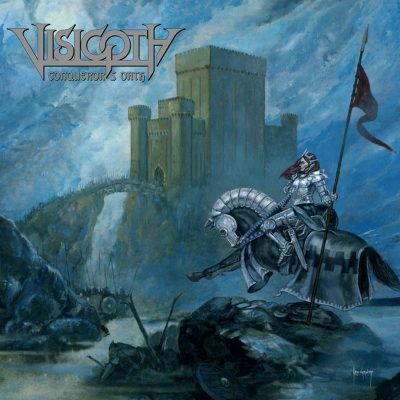 One thing is certain: There is no such thing as the sophomore slump for Visigoth. I actually enjoy Conqueror’s Oath significantly more than their debut, Revenant King. This is mostly due to a massive amount of riff candy, guitar solos that don’t repeat themselves and a rhythm section that is not just a background for guitars and vocals. I was getting the hooks and incredibly crunchy guitars stuck in my skull halfway through the second listen. So with this storm of all the instruments pumping come the lyrics. In heavy metal, a catchy riff is just as important as a catchy chorus or potent lyrics. With Conqueror’s Oath I actually recognize and remember songs by name better than the debut. I won’t name particular song highlights, since it would pretty much be the entire album.